Learning a new language can seem difficult, if not impossible, at the very beginning. If you’re an adult, then it probably seems even scarier. You may have had a bad experience trying to learn a second language in school. You’re not going to pull out your hair while learning French. It won’t be long until you amaze your friends and family by speaking French to them. Learn the most common words spoken in public. It seems that learning a foreign language is difficult because there are so many words to learn. In fact, this isn’t the truth at all. There are only about 1,000 words that you need to learn. If you learn just these words, it’s possible to have a conversation with just about anyone. You’ll be talking to strangers in no time, and it will even surprise you. A second language opens up a new world of opportunities. The time to learn is now. Don’t put this off for a single second longer. Learning a second language couldn’t be easier than it is today. The most important investment you’ll ever make is in yourself. Take this opportunity, and make the most out of it. This book was HORRIBLE!! It was totally random words ( No organization whatsoever) spoken 3 times each followed each time with the English translation (which, in my miniscule knowledge of French, I question some). No context, no explanation of how the pronunciation changes when consonants precede vowels in separate words, no word groupings for comparison. The reader was SO concerned with the Parisian "r" that he muddled the rest of the pronunciation. PLUS, some of the Most Vile words. I am certainly not a prude nor a stranger to "sailor speak"; but, I was appalled. This is not learning to speak French. This is listening to someone list words without a single mention of constructing a sentence or conjugating a verb. It was not the book that I thought it was. It did not help me. This "audiobook" is nothing but a set of random words in French with their translation (each word repeated thrice). It does nothing to help with spelling, grammar, putting it in a sentence, contextualizing, etc. It doesn't help when words that sound similar have different translations eg. "Elles" and "Elle" being pronounced the same as a single word (without the liaison), being translated as "they" and "she", without providing any explanation or spelling of these words. I'll be sure to avoid more language "audiobooks" by Frobose! I suggest you do too. This is a fantastic book for improving your French on any level.Good book! I reaffirmed what I already knew and discovered a few surprises as well as correcting a few faux pas I had been making for years. Would love to see an intermediate or advanced level of this book Learn French Fast for Beginners'.French learning is easy.If u buy this 'Learn French Fast for Beginners' Book. To do smooth business dealing i decide to learn French that is the reason to get this book whereas I already have reading material but that is not comprehensive. Learn French Fast for Beginners Really does work using this method. Really amazing book Learn French Fast for Beginners. . The audio is clear and smooth. I'm rather picky on language books, and I love it when language books are easy while remaining accurate and educational.I try to do little and often but even if I've left learning weeks I still quickly pick it up again due to the teaching style. This one definitely gets my approval! This book is a great way to learn French. I have studied French before but I learn best when I am fully immersed in a language. 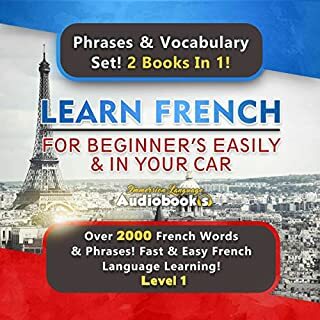 It takes some studying and really thinking about the use of words and the order difference from English.This book Learn French Fast for Beginners has helped me to learn the basics of French and this was exactly what I wanted as I am a complete beginner. The book supplies a vocabulary translation for words that would be deemed tricky. Overall a great option that I think will help in learning French.I use it as a reference book because I have never taken French before. Sometimes when I am unable to understand, the authors' explanations are simple and easy to read. I really like the book. This is a wonderful book. really great.. Each chapter also provides topical vocabulary lists, which are an added bonus. Of course once in France, the real lessons begin.Great systematic review lesson by lesson starting with elementary French and progressing in short lessons to a cumulative summary of the language for the conscientious traveler. They are well organized and are a perfect format for me to pick up at random moments to practice. it will help me to communicate better.I think this will be very helpful.earn French in the best way you can. Here are a long list of vocabulary that is very much reliable and most searched words. It's a great source of French language. I highly recommend this book. I thought this was not a good book. But after buying this audio book ,i understood that my idea was totally wrong. It explained things in a way that was easy to understand. For the same price, there are other books available that can not cover more information as like this one.A good introduction to the basics of the language as a whole. It may help if more examples e.g. A complete phrase or sentence to illustrate the verb being discussed. The ability to speak foreign languages is a solid competitive edge in your cv. The learning process itself is an excellent training for your brain.Indeed, you can get some new experience about gendered nouns in French. Your motivation is a key factor to success in language learning process. learning French language is not that easy.This is a great informative book for learning French. A great learning book.However, with this audio book,I feel that I can learn French language faster than I expected. I also find it easy to listen and understand. This is a great reference to refer to when trying to get around in a French speaking country, like Canada or obviously France. Many of the most common terms and phrases (greetings, common questions, seasons, days a week, numbers) are broken down into easy to remember sections. Once you grasp these phrases, the combinations are endless. 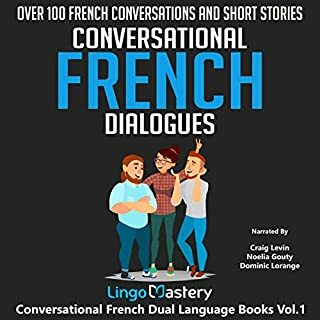 Excellent and extremely easy to use.I've studied French for about one year now and have found this audio book book to be a fantastic explanation.The author & the narrator has a very friendly and laid-back voice, and they both seem to sympathize a lot with English to French learners.Recommended this audio book for all French language learners and for all those who want to explore France. This is the book my students chose for an intermediate class I teach privately. We are working through it from the beginning to review all the French grammar it presents. Each chapter also provides topical vocabulary lists, which are an added bonus.Very helpful in learning word gender and how to pronounce French words! I'm preparing for a major French exam for work . 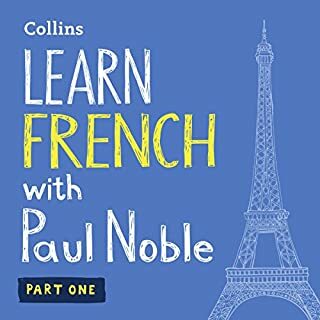 Couldn't ask for better.Without the help of this audio book i couldn't teach French language to my students, who are really interested to learn the French. This does not teach you to speak French! I cannot for the life of me understand all the 5 star reviews for this book, and statements such as “best French lesson ever”. All this audiobook does (for 3 tedious hours) is take random words and repeat them with their English translation 3 times in a row, then move on to the next random word. No context. No use of the word in a sentence. That is NOT teaching anyone HOW to speak a language. Might be useful to add to your vocabulary, but it will not help a novice to speak French in any meaningful way. Can you tell I’m annoyed by the misleading blurb and reviews...? 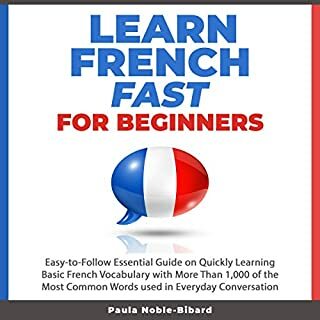 If you are a patient person who is willing to take the time needed to learn the needed vocabulary and French language basics step by step,and "get them down" correctly along with having a French-English dictionary to hand for occasional reference, then you should listen this book.I use it as a reference book. Because i have never taken French before. Sometimes when I am unable to understand, the authors' explanations are simple and easy to understand. I really like the book. Like many people learning French, I am consistently starting, getting frustrated, stopping, and then starting again.This book was a really nice change of pace from all of the Language apps out there. For me, it worked as a great supplement.The author takes the time to systematically work forward at a nice pace. 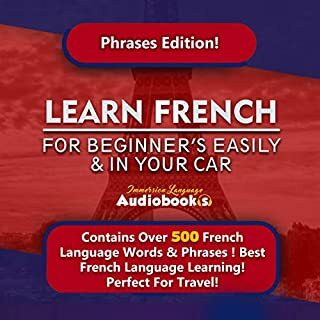 I’m glad I gave this a shot.The narrator breaks down the language in a way that you never forget the words.With the help of this audiobook any beginners caneasily learn French Fast. 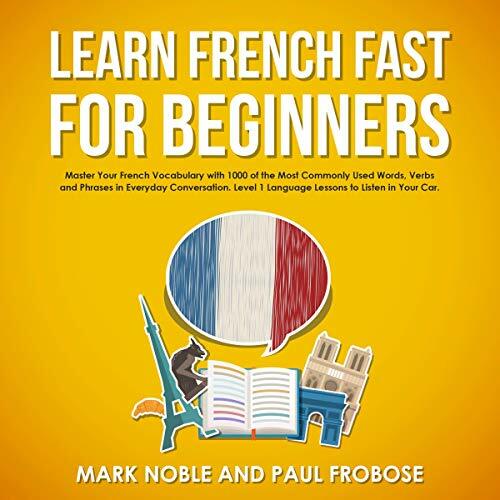 .This audio book condenses it and makes it so user friendly.I learned French words fast. A great experience. I have tired multiple language apps to try and learn French, yet this book surpasses them all!.This is the best program for gaining a firm foundation in the French language when you are teaching yourself.With this program I'm learning French fast without thinking about it and it is "clicking" with me as never before.Sure, you are not going to be fluent even after going through all four parts of this program, but you will havea solid grip on the language for further study. What i've learnt about French, all credits by this book.Absolutely unique book. they advance too quickly and the learner gets frustrated and wants to quit. then you better listen to this audiobook.